Getting ready to go off on vacation is always plenty hard, especially getting caught up on the bookwork and taking care of all the business odds and ends that need to be completed before leaving for a week. Not to mention packing! The clerical end of the business is not my strongest suit, and I often get behind. Normally, every so often I take a day off from the barn and spend it catching up on paperwork, usually either on a rainy day, or on a very hot one. But this spring the weather has been so glorious that I haven’t been able to make myself spend a day inside - so I am even more behind than usual! I had a list a mile long of things that I absolutely positively had to get done before heading off to Belize for a holiday, not least of which was packing. As I was scheduled to fly out early Saturday morning, I set aside Friday afternoon and evening to get these things done. I rode a few horses in the morning and planned to be out of the barn by noon. Well, a spur of the moment show-for-sale appointment delayed that until about three, but I was still optimistic that if I really hurried and worked all afternoon and evening I could get most of the things on the list taken care of. So, I sat down to check my e-mail at about four that afternoon, and the first thing I did was open one from United Airlines, informing me that I could check in online for my eleven o’clock flight the next morning. OK, check in online, that sounded convenient. Uh-oh, wait a minute, eleven o’clock?!? My flight was supposed to be at 8:40, with a connection in Charlotte , NC at 10:30! I called United and talked to a funny little man with an Indian accent. I learned that they had changed the time on my flight and had not informed me, which of course made my connection impossible. “Uh–oh, we have a big problem,” my accented friend told me. There were no earlier flights Saturday morning with space available. He told me, “The only way you can get to Belize tomorrow is if you leave now!” He wanted me to fly to Charlotte that evening, spend the night there, and catch the early plane to Belize City in the morning. “Well, you better hurry up!” he informed me. I frantically threw some clothes into a bag with my diving gear, canned most of the list of things I ‘just had’ to get done, and headed for Dulles Airport . My vacation was off to a wild start! The next morning at the Charlotte airport, I met up with my companions for the week: my sister Patty, her husband Rob, and their daughter Lindy, who recently graduated from college. We caught the flight to Belize City , and from there took a very small plane to our destination, Ambergris Caye. For those of you who are thinking, ‘Where the heck is Belize ?’ I will admit that when Patty first invited me to join them for the trip, I had no idea where it was either. 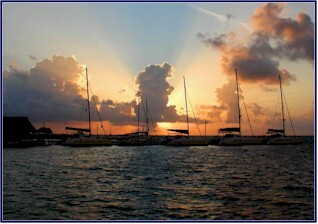 Belize is in Central America, right below Mexico , on the eastern side along the Caribbean Sea . It is a smallish country with a population of only about 280,000. Its citizens are mainly of Mestizo, African, or Mayan descent. English is the official language, but Spanish is widely spoken. Agriculture and tourism are the main industries. 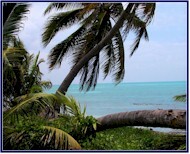 We arrived at Ambergris Caye mid-day, and checked in to our condo, right by the beach, at a lodge called ‘The Palms.’ The island is off the coast of the mainland, and is about one mile wide and 25 miles long. 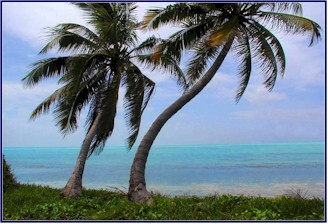 The land itself is unimpressive, low-lying and swampy; but the shoreline is lovely, with white sand beaches and palm trees, and brilliant turquoise water. 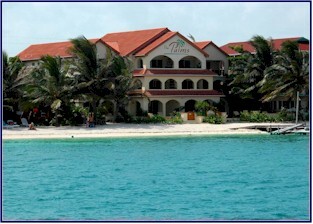 I thought the name Ambergris Caye was very lovely and intriguing. I figured it most likely had originated from the Mayan people, and that the word ‘Ambergris’ probably had something to do with the gods, or brave and valiant warriors from ancient times, or perhaps untold treasures yet to be discovered. But upon doing research after the trip, I learned that actually the island was named for large lumps of ambergris that were found on the beaches. And what is ambergris? I looked it up on the Internet; it is a waxy grayish substance formed in the intestines of sperm whales, often found floating at sea or washed ashore. It is added to perfumes to slow down the rate of evaporation. How romantic! We had our first perilous adventure that afternoon; a trip to the grocery store! We were staying near San Pedro, the biggest town on the island but still fairly small, so we were happy to learn that there was a large grocery store about a 10 minute walk from our condo. Thinking that we would usually go out for dinner, but save money by fixing our own breakfasts and lunches, we set out on a shopping expedition. It was quite hot and humid, plus we were hungry, so by the time we reached the supermarket we were delighted to find that it was spacious, well stocked, and air-conditioned. We were limited in how much we could buy by the fact that we would have to carry everything back to the condo, or at least so we thought. With this in mind, we tried to be very frugal. We bought enough food for a couple of breakfasts, sandwich makings for two lunches, a few snacks, and some beer and wine. Imagine our shock when we checked out and the total came to over $300! (Yes, that is US dollars; it was over $600 in Belize currency!) We all agreed that it was a unique experience to pay nine dollars for a small jar of peanut butter. The clerk generously offered to deliver our groceries to our lodge so that we wouldn’t have to carry them; it is probably a really good thing we didn’t know that while we were shopping, we might have bought much more! We decided that we would avoid grocery shopping as much as possible for the rest of the week; it was more expensive than dining out. We saved money that night by going to a nice seafood restaurant and ordering the lobster! After dinner we walked home along the beach. We stood out on the end of the pier and admired the equatorial stars, and some of the southern constellations we don’t get to see at home. It was a beautiful clear night, warm and balmy with a good strong breeze. We enjoyed the sounds of the water and the wind. I had set my alarm for seven o’clock. When it went off, I got up and looked out the window and marveled at how dark it still was. I got dressed and went for a walk on the beach. I was amazed at how still and quiet everything was; I had the beach almost totally to myself. The sun was just above the sea, and there was a lovely breeze. I walked along enjoying the solitude. Then I glanced at my watch; it read 5:20. I had set my alarm clock, but had forgotten to change it for the time zones; I had gotten up two hours early. No wonder the sun was just coming up and I was alone on the beach! After breakfast we went next door to the dive shop and collected our scuba gear. We met our divemaster, Rolando, and his son who was helping him, also named Rolando. They took us out on a small boat called the ‘Carmelita.’ The reef runs roughly parallel to the shoreline, in places there are bits of it sticking up above the water at low tide, and you can see the waves breaking on it with small whitecaps. Rolando told us it is the second longest barrier reef in the world. On the way out to the dive site we saw a dolphin; we watched as it swam near the boat and checked us out. We are all certified scuba divers, so Rolando (senior) gave us an informative and humorous briefing on the diving protocol for his boat, and into the water we went. It was very warm, no wet suits needed. The visibility was fair, though not as clear as it can be because they had been getting a lot of wind and rain recently. Rolando senior accompanied us on the dives, while Rolando junior would man the boat and pick us up when we were ready to surface. 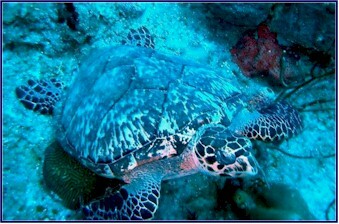 As I have always found when diving in the Caribbean , the undersea life we saw was varied and spectacular. The tropical fish come in a rainbow of colors; some of my favorites include the yellow-tailed damsel fish, a deep blue with iridescent light blue spots like neon, and the brilliantly colored parrotfish, which comes in a wide variety of colors. The tiny purple and yellow fairy basslets, the indigo hamlet with its bands of shaded blue, and the graceful and extravagant angelfish are just a few of the beautiful fish that inhabit the reefs; there are literally hundreds of species that you see each time you go down. You often see large eels, rays, sea turtles, and an almost endless list of other unique underwater creatures. The coral builds the reef into an intricate maze of underwater canyons and ravines; you never know what will be waiting around the next corner! 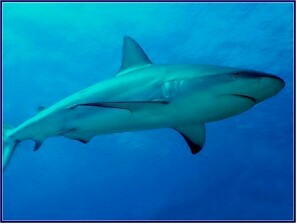 Lindy told the divemaster that she wanted to see sharks; she had never seen any while diving before. We saw nurse sharks almost right away; these are fairly benign members of the shark family, and they somehow remind me of great big catfish. The largest were around four feet, and they were placid, so we could approach them fairly closely. We also saw a tiny spotted drum, brilliantly striped in black and white, swimming in small circles with his long elegant dorsal fin gaily waving above him. These small fish are often hard to find, and I always love to see one. A school of hundreds of colorful Creole Wrasses swam right by and all around us; they are among my favorites, and I always love the chance to swim with these purple fishes. After two really nice dives we headed back to the condo, where Rob made Margaritas. We went to the crab shack for lunch; after all, we couldn’t afford to eat in too often! After lunch we rented a motorized golf cart and set off to explore the island. There are not very many cars on Ambergris Caye, but the golf carts were everywhere; in fact you had to be careful to avoid being run down in the street by them. We had been warned that the roads were not very good; this proved to be an understatement. We drove on sand roads that were very wet and uneven, with large water-filled potholes. As we were discovering, it was the rainy season! We left San Pedro and followed the road that headed toward the southern end of the island. We left the tourist resorts behind and traversed through a residential section; it was very poor and somewhat depressing, with small houses and shacks built up on stilts, and everything half flooded. We were in search of crocodiles; we had heard that there was a place along here where you could see them. We had been told that sometimes tourists buy chickens at the grocery store and put them on a rope to lure the crocodiles in to the shore for a meal. With the price of groceries on the island, the thought of this seemed extravagant indeed! Chickenless but enthusiastic, we headed out through a less populated area of swamps and ponds to try to find the crocs. We had been told that they were just 10 minutes up the road, but we had gone far longer than that with no sign of them. We came to a section of road that was especially bad. Rob was doing a valiant job of driving, but the golf cart was a piece of junk, constantly stalling out. We tried to cross a huge pothole in the road, but the water proved to be deeper than we had realized; the cart quit on us again and was stuck. As we were contemplating our dilemma, suddenly we were viciously attacked! No, not by the crocs, but by several million bloodthirsty mosquitoes! They were in a feeding frenzy, feasting on any areas of exposed flesh while we frantically slapped and scratched at them. We leaped out of the cart into the ankle-deep murky water and managed to push the cart to solid land, slipping and sliding and slapping in our frenzied efforts to avoid exsanguination. Once back on board, we turned around and headed back towards town as fast as we could, with Rob pushing the sputtering vehicle to the max as we tried to flee the voracious insects. No more exploring the swamps for us! *Note to self: When golf carting through an area known as “ Mosquito Coast ,” bring bug spray! * We later learned that this area was where the Harrison Ford movie by that name was filmed. On the way back to town, we did find the lake with the crocodiles. We saw several large ones floating in the water not far from the shore, but we couldn’t get their attention, lacking a chicken on a rope for bait. We tried to use Lindy but she wouldn’t cooperate. We stopped at a small store and bought a bottle of bug repellant; this turned out to be one of our better purchases throughout the week! In the morning it was back on the Carmelita with Rolando and Rolando. We went out to the reef again on the boat, and we had two great dives. 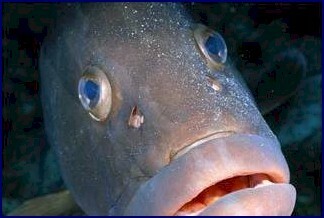 We hung out with the groupers; these large docile fish will often approach divers and follow them. There were several really big groupers at our dive site, about three feet long, and they were very curious and friendly. They swam with us for most of the dive. One of them went face to face with Patty, peering in her mask. One of the highlights this morning was seeing the eagle rays; these large graceful creatures appear to fly through the water as they flap their huge ‘wings’ in slow motion. We also saw a large green moray eel swimming; it is unusual to see one of these out of its hiding place and in the open. A large silver tarpon passed by; he was about four feet long. Scuba Diving gives you a great sense of freedom. Once you achieve neutral buoyancy, gravity ceases to exist, and you can float over the underwater caverns and canyons; it feels like you are flying. As you go along, on the one hand you have the reef, the bright coral and the colorful fish, and you follow the edge of the wall searching the nooks and crannies to see what unusual or rare things you can find. You examine the diversity, and you delight in the details. The mood is bright and inquisitive, like a sunny day. But on the other side, you look out from the reef towards the ‘great blue yonder,’ where you might see a flash of silver as you catch a glimpse of a game fish as it swims swiftly past, or a ray, or perhaps a shark, or who knows what else. It is mysterious and compelling! You always want to go see what waits around the next corner, or just below in the next ravine. Part of you wants to head east and down and just keep going. I love to soar out over the top of the cliff, away from the other divers, as if I was going to just swim away from the wall and out into the sea. 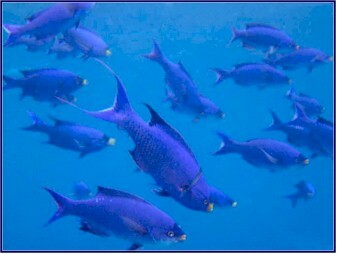 But of course, I don’t dare get too far from the others, so I soon have to turn back toward the reef. But all the while the open water beckons. Drive fast over potholes in overloaded Golf Carts. Little did we know that by the end of the week we would have engaged in many of these activities! We met Rob for dinner at ‘Carambas,’ where we took advantage of the fact that lobsters were in season. Since mosquitoes were also in season, we liberally slathered ourselves in bug spray for the walk home along the beach. We got up at 4:45 to be ready when the water taxi picked us up at 5:30, and headed out for Lighthouse Reef. 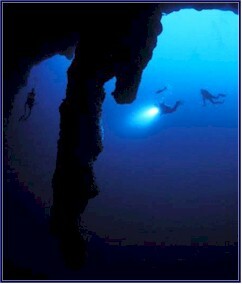 Today we were to dive the Blue Hole! We were joined by about 15 other divers for the two hour boat trip out to the location, with a breakfast of fresh fruit and stale cookies provided. I always love the boat rides; Lindy and I spent most of the trip out on the bow, except for when the seas got so rough that we were in danger of being thrown off and had to scramble back inside. 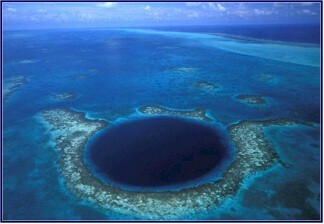 The Blue Hole is a large underwater sinkhole which was made famous by Jacques Cousteau in one of his documentaries. It is surrounded by a coral reef and shallow water, 40 to 50 feet, but the Blue Hole forms a perfect circle about a thousand feet across, and within this circle the depth plunges to over 400 feet. The hole is the opening to what was a dry cave system during the Ice Age, when the water level was lower and the caverns were above sea level. There were about eight divers in our group. The dive captain gave us a briefing; he told us to stay together in a line during the dive, and that there would be two divemasters in case of trouble. We would descend to 130 feet, where we could stay for just 8 minutes. At this depth one has to be very careful; if anything goes wrong you are a long way from the surface! The second divemaster would be prepared to bring up anyone who experienced difficulties. He told us that once we were down in the hole, the focus would be on exploring the construction of the cavern and the unusual formations we would see there; not to expect to see a lot of fish - though we might see sharks. As he again stressed the importance of staying together and carefully monitoring our gauges, we realized that this dive was definitely not for the faint of heart! Once our group was all in the water, we gathered below the boat at a depth of about 45 feet. The white sand floor sloped downward to the entrance. The hole below us was a dark deep blue; little light filters into it. Several large groupers accompanied us as we swam down to the rim. We hovered there, looking into the darker water below us, before going over the edge and down into those mysterious depths. As we descended we saw that the walls consisted of many huge stalactites and stalagmites; they were massive, and you could swim in and out among them. It was spectacular! 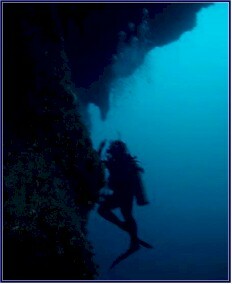 We gradually dropped down deeper and deeper, and following our dive master we proceeded among the magnificent formations. I brought up the rear of the group. At 130 feet, I felt very aware of how deep we were. The light was dim, and because of the pressure, breathing became more difficult. Everything seemed to happen in slow motion in this silent world, and there was a sense of unreality to it. It was unique and beautiful; and also a little scary! What happened next seemed even more unreal. Glancing away from the wall formations out to the dark blue water of the hole, I caught a quick glimpse as a shadowy figure swam swiftly by, a faint silhouette in the dim light. Looking again, I saw it return; the sleek body of a shark, closer now. It disappeared into the distance, but soon I glimpsed it again; now there were two of them. They were circling around near us, checking us out – but now there were four! The sharks continued to move closer, and to multiply in numbers with every pass. They appeared to be between five and eight feet long. Each time they would move out of view and then return again, reappearing out of the murky depths, there would be more of them. 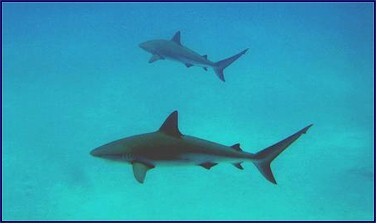 Six, eight, now a dozen; soon there were more than fifteen sharks circling near us! Several of the sharks broke off from the others and came closer. Two of them swam straight towards me. I started to think that maybe it wasn’t too smart of me to be at the back of the line! They came right at me, close enough that I could see their beady black eyes. Pretty much every diver wants to see sharks. Non-divers always ask, “Aren’t you afraid of getting attacked by sharks?” But the truth is most scuba divers live for shark sightings, as it happens but rarely. Of course, none of us want to see ‘Jaws’ coming after us, but a chance like this to see sharks in action in their natural environment was an exhilarating thrill. I wasn’t afraid of them. As the two sharks swam closer, I reflected on the fact that dozens of people dive in the Blue Hole every day, and that the dive master had warned us that we might see sharks, and that he was responsible for our safety and did not seem unduly alarmed; so I was not scared. But as they got almost close enough to touch, I started thinking, “Maybe I should be!” At the last second the two approaching sharks dived underneath me, and turned and swam back out into the darker blue. The sharks continued to scope us out the whole time we were down in the hole, and several of them accompanied us back up to the top. We had an eight minute decompression stop at 20 feet, and we could see a few of the sharks still circling around. Once back on to the boat, we learned from our divemaster that most of those we had seen were Caribbean Reef Sharks, commonly encountered in the Blue Hole, but that there had also been several bull sharks among them, which are known for their particularly unpredictable and sometimes aggressive behavior. I wondered if these were the two that swam towards me! We all thoroughly enjoyed the whole experience, and voted it one of the greatest dives ever! In the afternoon, the boat took us to a marine park where we had two terrific wall dives. 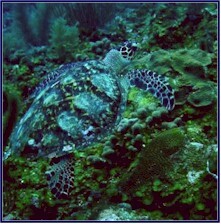 We told the divemaster that we wanted to see turtles, and jokingly asked if he could promise some on this dive. He replied that sure, he would promise us turtles. Also, whale sharks, great whites, mermaids, hammerheads and penguins. He said, “In Belize , we promise everything; but no guarantees!” We did indeed end up seeing two really nice sea turtles on that dive, each about three feet long; we watched them swim past us in slow motion. The two hour boat ride back to Ambergris Caye was an enjoyable way to finish off a great day, sitting on the bow with the wind in our faces and the spray occasionally getting us damp when we hit the bigger swells. The boat crew served us coconut rum with diet coke, it tasted horrible!